South-Eastern European (SEE) countries have recently engaged in a regional integration process, through the establishment of free trade agreements between themselves and with the European Union (EU). This study evaluates the impact of this process on trade and firm performance. Three complementary approaches are used. The first consists in evaluating the degree of trade integration of SEE countries and determining their trade potential with their main partners, i.e. themselves and the EU. The second approach tries to evaluate the evolution of tariffs and nontariffs barriers, faced by SEE countries and estimate their effects on manufactured trade. The third part investigates the impact of trade liberalization on performance of firms in SEE. In particular, we are interested in what extent foreign trade and foreign direct investment contributed to improvements in firm performance. Several interesting results emerge from this study. Concerning our first approach, we find three results. First,Western Balkan countries have reached their trade potential for almost all sectors while Eastern Balkan countries have outreached them. One can therefore expect an increase of trade flows between the Western Balkans and the EU. Second, it seems that preferential trade agreements between SEE countries will have a limited impact on their mutual trade since their trade potentials are already reached. Third, all SEE countries' trade is below its potential with the rest of the world. Concerning our second approach, we find that exports are increasing in all sectors during the period 1996-2000, while bilateral tariffs are decreasing. However, this liberalization process exhibits small effects on trade. On the other hand, we find that nontariff barriers are increasing during the period. Trade liberalization should not be treated as exogenous (Trefler, 1993). Domestic firms, competiting with Balkan exporters, may have increased their lobbying activity for greater protection. As a result, NTBs increase and hurt exports of Balkan countries. In that respect, we find large estimates of NTBs on exports of manufactured goods. Concerning our third approach, we do not find a general pattern of uniformly significant impact of extensive trade flows on individual firm's TFP growth. Specifically, only in Romania and Slovenia, higher propensity to export to advanced markets (EU-15, rest of OECD countries) has a larger impact on TFP growth than exporting to less advanced markets such as new EU members and countries of former Yugoslavia. The role of imports follows a similar path as exporting. Importing from the advanced countries is important for firms in Romania. At the same time, for firms in Romania and Macedonia importing from countries of former Yugoslavia provides a dominating learning effect. For other countries in our sample no learning effects from exporting to and importing from individual geographic regions could be found. 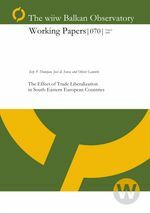 Thus, one cannot imply that liberalization of bilateral trade within the region of SEE or with the other regions will have uniformly significant impact on individual firm's performance, but in some of the countries analysed trade liberalization might be an important engine of firms' productivity growth. Our results also indicate some selection process in FDI decisions by parent foreign companies. Foreign parent companies seem to select smaller firms in SEE as well as least productive, less capital and skill intensive firms. However, we find contrasting results on the impact on foreign ownership on TFP growth. Three countries (Bosnia, Croatia and Slovenia) experience faster TFP growth in foreign owned firms. In Romania, in contrast we find faster TFP growth in domestic owned firms, while in Bulgaria no significant differences have been found. However, one can expect that after restructuring these firms would improve their TFP at a much faster rate than purely domestic owned firms.